Developmental dyslexia is associated with functional abnormalities within reading areas of the brain. 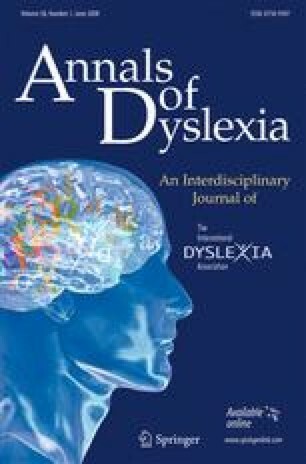 For some children diagnosed with dyslexia, phonologically based remediation programs appear to rehabilitate brain function in key reading areas (Shaywitz et al., Biological Psychiatry 55: 101–110, 2004; Simos et al., Neuroscience 58: 1203–1213, 2002). However, a non-trivial number of children diagnosed with dyslexia fail to respond to these interventions (Torgesen, Learning Disabilities Research & Practice 15: 55–64, 2000). A cross-sectional fMRI study investigating post-treatment effects was conducted in an effort to better understand differences in brain function between treatment responders and non-responders. Educational testing and brain activation measured after treatment suggested that the reading intervention used in the present study rehabilitated several basic level reading processes in all participants diagnosed with dyslexia. However, activation in the left inferior parietal lobe differentiated treatment responders and non-responders in comparison to non-impaired readers. Children with persistent deficits in single word decoding (treatment non-responders) demonstrated significantly less activation in the left inferior parietal lobe when compared to non-impaired readers.